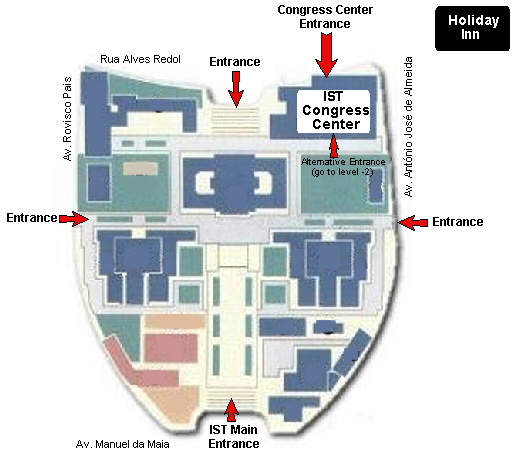 The Holiday Inn is particularly close to IST (100 meter distant from IST - see map below). There is a block reservation for Holiday Inn, held until February, 15. Please fill the Hotel Booking Form (available in Word or PDF formats) and send it directly to the hotel. Reduced fees have been agreed with the Holiday Inn (€ 80.00/single and € 90.00/double, including breakfast and all taxes). The maximum walking distance is 15 minutes with some hotels being less than that. It is highly recommend that you book a hotel room as early as possible in order to avoid a longer commute to the workshop. Other hotels are also available.